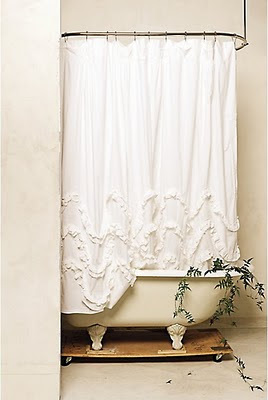 Suzannah at Adventures in Dressmaking made a version of this Anthropologie shower curtain from 90-inch muslin. If you don't want to deal with buttonholes and grommets, it probably could be made from two inexpensive white shower curtains. Keep one curtain and cut up the second one for the ruffles. This is so pretty! I need to try it!